For naval operations in the Southwest Pacific area, including the Netherlands East Indies, the Philippines, the Solomon Islands, and New Guinea, see South West Pacific theatre of World War II. For other uses, see Pacific Theater (disambiguation). The Pacific Ocean theater, during World War II, was a major theater of the war between the Allies and Japan. It was defined by the Allied powers' Pacific Ocean Area command, which included most of the Pacific Ocean and its islands, while mainland Asia was excluded, as were the Philippines, the Dutch East Indies, Borneo, Australia, most of the Territory of New Guinea and the western part of the Solomon Islands. The Western Allies' command structure in the Pacific. It officially came into existence on March 30, 1942, when US Admiral Chester Nimitz was appointed Supreme Allied Commander Pacific Ocean Areas. In the other major theatre in the Pacific region, known as the South West Pacific theatre, Allied forces were commanded by US General Douglas MacArthur. Both Nimitz and MacArthur were overseen by the US Joint Chiefs and the western Allies Combined Chiefs of Staff (CCoS). 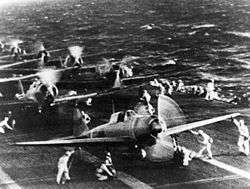 Most Japanese forces in the theater were part of the Combined Fleet (聯合艦隊, Rengō Kantai) of the Imperial Japanese Navy (IJN), which was responsible for all Japanese warships, naval aircraft, and marine infantry units. The Rengō Kantai was led by Admiral Isoroku Yamamoto, until he was killed in an attack by U.S. fighter planes in April 1943. Yamamoto was succeeded by Admiral Mineichi Koga (1943–44) and Admiral Soemu Toyoda (1944–45). The General Staff (参謀本部, Sanbō Honbu) of the Imperial Japanese Army was responsible for Imperial Japanese Army (IJA) ground and air units in Southeast Asia and the South Pacific. The IJN and IJA did not formally use joint/combined staff at the operational level, and their command structures/geographical areas of operations overlapped each other and those of the Allies. In the Pacific Ocean theater, Japanese forces fought primarily against the United States Navy, US Marine Corps and US Army. The United Kingdom, New Zealand, Australia, Canada and other Allied nations also contributed forces. Toll, Ian (2012). Pacific Crucible: War at Sea in the Pacific, 1941–1942. W. W. Norton and Company. ISBN 0-393-34341-3. Potter, E.B. ; Chester W. Nimitz (1960). Sea Power. Prentice-Hall. Kafka, Roger; Pepperburg, Roy L. (1946). Warships of the World. New York: Cornell Maritime Press. Ofstie, Ralph A. (1946). The Campaigns of the Pacific War. Washington, D.C.: United States Government Printing Office.